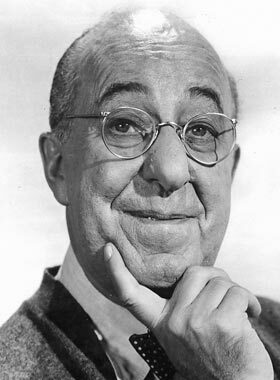 Today in Masonic History Ed Wynn was born in 1886. Ed Wynn was an American actor and comedian. Wynn was born in Philadelphia, Pennsylvania on November 9th, 1886. He was born Isaiah Edwin Leopold. He attended Central High School in Philadelphia until the age of 15 when he ran away from home. He worked as a hat salesman and utility boy after running away. When he started to perform he adapted his middle name for his stage name changing "Edwin" to Ed Wynn. He did this to spare his family the embarrassment of having a comedian in the family. Wynn started in vaudeville as many comedians of the time did. He would eventually move into radio. In his early career of vaudeville and into radio he would brag that every word he spoke he wrote. Later in his careers others would provide him dialogue. In the 1930's Wynn hosted the popular radio show The Fire Chief. He, like other vaudevillians who made the transition to radio, insisted on performing in front of a live studio audience. Despite the fact home listeners could not see him, Wynn continued to rely on costumes and sight gags for the in studio audience. To open his show he bounce gags off the announcer and straight man Graham McNamee. Wynn's customary opening for the show became something of a catch phrase for Wynn. He would open the show with "Tonight, Graham, the show's gonna be different." He would then follow up with a joke like "Graham, my uncle just bought a new second-handed car... he calls it Baby! I don't know, it won't go anyplace without a rattle!" In 1933, Wynn founded his own radio network, Amalgamated Broadcasting System. It lasted only 5 weeks and nearly destroyed the comedian. According to at least one radio historian the failure left Wynn divorced, in debt and with a nervous breakdown. In 1939, Wynn was offered the role of The Wizard of Oz in The Wizard of Oz in the MGM film. He turned the role down. Starting in 1949 and going through the 1950's, Wynn appeared in a variety of television shows. Some were variety shows and others were situation comedies, the last of which was the one season Ed Wynn Show during 1958-1959 season. Around 1956, Wynn's son, Keenan Wynn convinced his father to try dramatic acting in television and movies. The first film the two did together was Requiem for a Heavyweight. The play written by Rod Serling and starring Jack Palance was about a washed up boxer who was making a comeback. During rehearsal Wynn continually flubbed his lines and became very frustrated by the dramatic acting. Producers wanted to fire Wynn when Palance stepped in and said that if they fired Wynn he would quit. Unknown to Wynn, an understudy was put in place in case of problems on the live broadcast of the play. To everyones surprise Wynn played the part brilliantly and was even able to ad lib in places where he flubbed lines. In 1959, Wynn received a Best Supporting Actor Academy Award nomination for his role in the Diary of Anne Frank. That same year he would appear in The Twilight Zone in an episode written by Serling specifically for Wynn called "One for the Angels." In the episode Wynn plays a toy salesman beloved by the neighborhood children. When Mr. Death visits Wynn's character he makes a deal with Death that until he makes the greatest pitch of his life "one for the angels" Death will let him stay. Initially he believes he has out smarted Death until he discovers that instead of Wynn's character Death is going to take a neighbor girl who Wynn's character is close to. He pleads with Death to take him instead, when death refuses he delays Death from going to the girl by giving the greatest pitch of his life to Death, knowingly fulfilling his deal with Death. Starting in 1961, Wynn began a relationship with Walt Disney. He appeared in several films for Disney. His most notable film appearance was in the film Mary Poppins. He played Uncle Albert who is afflicted with a laughing fit that causes him to float around the room. Wynn passed away on June 19th, 1966. He passed away from throat cancer. According to Wynn's granddaughter, Walt Disney was one of Wynn's casket bearers. Red Skelton who was discovered by Wynn said that "His death is the first time he ever made anyone sad." Wynn was a member of Lodge No. 9 in Philadelphia, Pennsylvania.